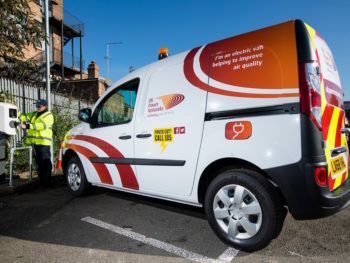 The electricity distributor is trialling eight electric Renault Kangoo Z.E. vans, which will be used by engineers running from depots in Brixton, Camden, Canning Town and Falconwood. The business is also taking action to encourage company car drivers to make the switch by introducing the first fully electric car to its company car list in the form of the Renault Zoe. The vehicles are being supported by the installation of 27 charge points across 14 of the company’s offices and depots – and the electricity network plans to power the charge points with on-site solar generation at six of the locations. UK Power Networks, which is a member of the Mayor of London’s EV Infrastructure Taskforce, is gearing up for wider take-up of EVs – the firm estimates that its networks across London, the South East and East of England will be used to power an estimated 4.1 million EVs by 2030, helped by its developments in smart grid technology. Patrick Clarke, UK Power Networks director of network operations, said: “We are leading the development of a smart, flexible grid to support EVs, improve air quality and reduce our carbon footprint. Piloting EVs in our fleet and introducing EVs to the company car list is improving the environment for communities now and investing in the health of future generations.